So, most of you reading this already have one reaction: "Bellarius, where the hell has this been? You're five days late with this one!" The tale this time is a rather unusual Christmas one, as it basically has the Doctor sitting at home, minding his own business, but then being dragged into things. 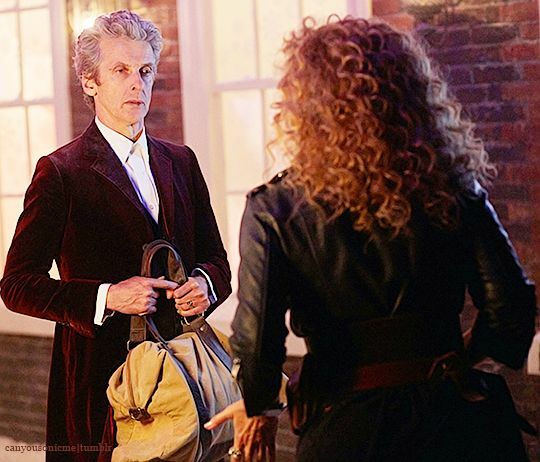 After a knock on the door, he's mistaken for a surgeon they're waiting for and brought before a dying warlord's wife: River Song. Out of his depth and wondering why in hell River is married to a mass murderer, the Doctor finds himself dragged along into River's life once more, for one final time. Let's just address the elephant in the room at first: Steven Moffat can't let go of characters. This is the third time we've had River reappear since her damn near perfect send-off, and it carries many of the same problems. It's an extension, she practically hijacks the entire series so things can focus upon her, and she's in full Mary Sue mode. That's not a term I use lightly, she really is introduced as taking all attention away from the Doctor himself and outdoes him at practically everything. There's nothing she's bad at, nothing she stumbles at, and she's always got an edge or answer over him. The problem is that, this is one side to the character, her worst side, and the better more engaging half is never given room to breathe until quite a long way into the story. The other issue, of course, is that this entire special is being used as yet another vehicle to try and promote a spin-off. No sooner do we have this finish than anyone with a Big Finish account is receiving multiple e-mails to grab a copy of her new series. Yeah, the ratings might be down, but this is two in a row we've had someone introduced, shilled as hard as possible and then a sudden spin-off launched about them. Say what you will about Torchwood or the Sarah Jane Adventures, but those only took a couple of episodes each to establish, and the writers never diverted the entire series to celebrate them. Still, now that elephant has been covered, it's worth noting that this story actually gets off to a very entertaining start. For one thing, it's one of the few which really seems to know how to play Doctor Who truly as a comedy, and let's the audience know of that from the start. 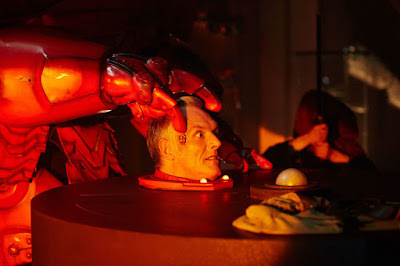 Between Matt Lucas showing up as a put-upon lackey and Greg Davies playing a ridiculously oversized killer cyborg warlord with a detachable head, it's established quickly as a humourous piece. To its credit, it also does this extremely well. While often seeming a little too much like an Eleventh Doctor situation, Capaldi himself is brilliant enough of an actor to work with the script. We see him playing his usual cantankerous self despite his surroundings, and even meeting River is something he pulls off with such familiarity you never realise the these two incarnations had never met before. Better yet, the meeting with River herself is played with near total incredulity as it becomes more ridiculous by the moment, rather than just accepting things. This helps to make the jokes all the funnier as it actually takes moments to point out how insane this is becoming without just letting it go or expecting the audience to just accept things. The episode basically ties to keep to the older Matt Smith format, but it honestly seems to have learned from past mistakes. While brimming with wackiness, it's never over-saturating the entire story and the audience is given breathers between events. They're small, often so much so you'll not notice them, but it's enough to recover from one joke just in time for the new one to kick in. 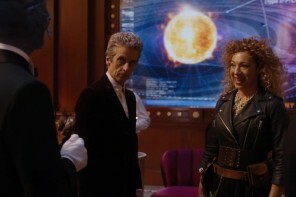 Two particular examples arise very early on, the first being when the Doctor and River moves away from the operating room, and the second being the moments right after their madcap escape via teleporter. They're hard to spot at first as there's still underlying humour present, but it's only toned down long enough to introduce the next big joke. It allows the story to peak at the right points (particularly Capaldi's faux reaction to the TARDIS interior) and have bits where the humour is simmering via quieter sections. The energy on display and enthusiasm is at the right level where, even someone jaded over River's antics here, can still find plenty of entertainment in the story's antics. This hits its peak when River finally reaches what is supposed to be the conclusion for a successful operation, only for an entirely new problem to arise all around the pair. The even camerawork seems to reflect this, often opting for some extremely unconventional shots and angles which seem oddly out of place, not to mention more than a few wide angle views. However, that really seems to work as the story is wholeheartedly embracing the absurd nature of the setting and Moffat's version of the Doctor Who universe as a whole. However, problems sadly come into play right after the story reaches its best moment, where Moffat suddenly decides he wants to be serious now. The audience is suddenly treated to a very emotional bit with River, which not only ruins half the joke of the first half but is entirely out of place. It would have been fine for a story in of itself, and the delivery is genuinely great, but it just doesn't match up with prior events leading up to that point. It would be like if a Monty Python sketch suddenly jumped to Roy Batty's famous speech, but played it completely straight faced and kept that way until the very end. They each work well on their own, but you can't have both slammed together like this. Matters are only made worse as the episode tries to keep that same serious tone Moffat has abruptly set-up, but also ties to close out on a big bang. So right after the big character moment, all the while now treating itself as a more serious story, you end up with an ending Even Edgar Wright would be left fighting an uphill battle trying to maintain some balance between those two tones, and the dissonance is very notable here sadly. It was likely intended to help serve as a transition between the goofier first half and the more emotional last few minutes, but that sadly only serves to make the shift in gears all the more noticeable as they jump into a finale. The worst thing though? The final scene is genuinely great. No, really, it's a wonderfully done conclusion to River herself despite being brought back and - if he decided not to come back - it would be a fantastic ending scene for Moffat's tenure. 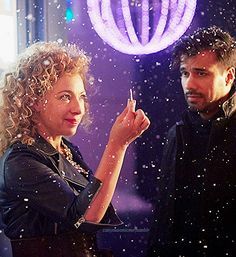 It really highlights the journey the Doctor and River have gone through, and closes things out on a great final note of happiness despite the often rough or tumultuous lives they have led. It's just a damn shame it wasn't either saved for a special or its own story, as it sticks out here like a sore thumb. In fact, it's so out of place you'd be forgiven for thinking someone had handed over the wrong script for the final days of shooting. Even as someone who doesn't hold the character in the highest regard, and will be the first to point out the problems in this story, it's still hard to damn this episode. 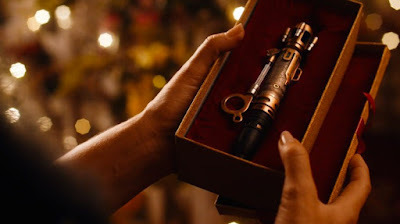 It's flawed, it is most definitely very flawed with more than a few bad decisions, but it's still better than the finale than anything given to Clara. There's still plenty of great gags and scenes, but the nature of the sudden turn means you're probably going to enjoy things more if you do watch them one at a time as isolated scenes rather than the whole thing at once. Give it a watch if you're interested, but don't expect anything truly great this year.